The style of coding is quite easy. It’s open source. No need to pay any subscription charges. Availability of instant access to over 7800 packages customized for various computation tasks. The community support is overwhelming. There are numerous forums to help you out. One of highly sought skill by analytics and data science companies. How to install R / R Studio ? In ‘Installers for Supported Platforms’ section, choose and click the R Studio installer based on your operating system. The download should begin as soon as you click. R Console: This area shows the output of code you run. Also, you can directly write codes in console. Code entered directly in R console cannot be traced later. This is where R script comes to use. R Script: As the name suggest, here you get space to write codes. To run those codes, simply select the line(s) of code and press Ctrl + Enter. Alternatively, you can click on little ‘Run’ button location at top right corner of R Script. 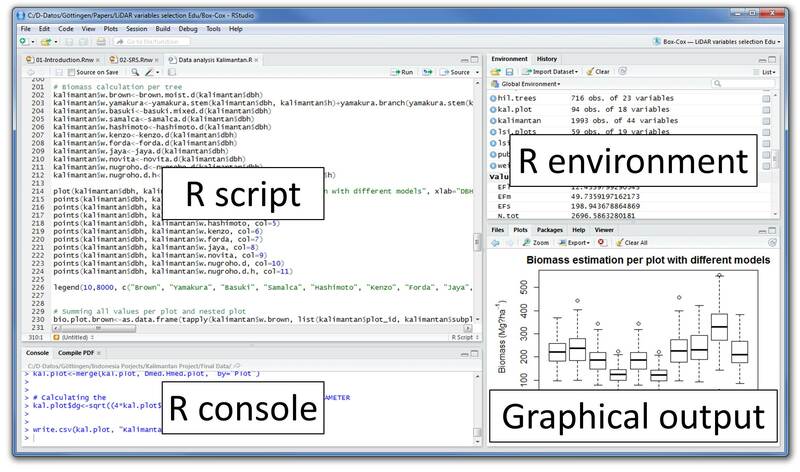 R environment: This space displays the set of external elements added. This includes data set, variables, vectors, functions etc. To check if data has been loaded properly in R, always look at this area. Graphical Output: This space display the graphs created during exploratory data analysis. Not just graphs, you could select packages, seek help with embedded R’s official documentation. How to install R Packages ? As a first time user, a pop might appear to select your CRAN mirror (country server), choose accordingly and press OK. Note: You can type this either in console directly and press ‘Enter’ or in R script and click ‘Run’. But, what if you have done too many calculations ? It would be too painful to scroll through every command and find it out. In such situations, creating variable is a helpful way.